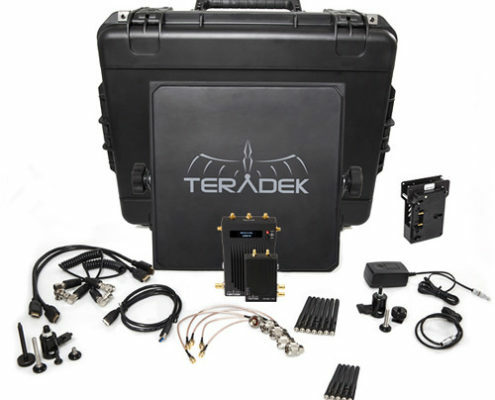 Transmit uncompressed 1080p SDI or HDMI video wirelessly over 1000 feet line-of-sight with the Teradek Bolt 1000 SDI/HDMI Wireless Transmitter & Dual Receiver Deluxe Kit. 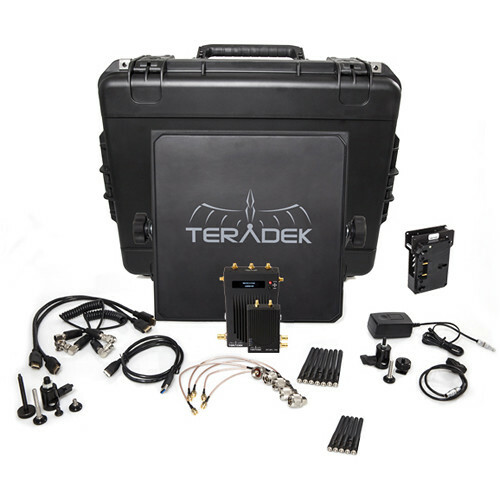 Included in this set are a Teradek Bolt 1000 transmitter and two receivers, which are equipped with both 3G-SDI and HDMI ports. The transmitter can pair with and multicast to up to four receivers (additional receivers not included). When transmitting uncompressed video, latencies of less than one millisecond can be achieved if no other video processing is necessary. The included Panel Antenna improves reception in crowded frequency situations. Transmitting across the 5 GHz frequency range, the transmitter/receiver pair utilizes Dynamic Frequency Selection (DFS) to find a clean signal between the transmitter and receiver. This is desirable when working in areas with crowded frequencies. Both transmitter and receiver are equipped with HDMI and SDI ports, which allow for cross conversion from HDMI to SDI and SDI to HDMI during transmission. The transmitter also features a loop-through SDI output. The USB GRAB engine streams the uncompressed video straight out of the receiver and into a PC for immediate recording. The included waterproof case with custom-cut foam carries all the bundled components during transport and storage. The Bolt 1000 transmitter and receiver pair can transmit 1080p60 video up to 1000′ line-of-sight with less than 1 ms of latency when not converting video formats. The transmitter and receiver can cross convert your video signal during transmission. The hardened aluminum chassis is designed to withstand the rigors of production, and features 1/4″-20 threaded mounting holes. The built-in USB port on the receiver enables direct connection to a computer, so you can capture video directly from the receiver into your computer over USB 3.0. With this video available, rough edits can be made even before the footage is offloaded from the camera. A built-in OLED information screen is built into the receiver. This enables rapid setup and confirmation of your settings. Utilizing the OLED screen, you can apply 3D LUTs with the press of a button. Upload your own LUTs using the free Bolt Manager software, or select from several built-in presets using Bolt’s OSD. You can select to transmit in 20 or 40 MHz channels. However, please note that while 20 MHz channels allow you to operate more wireless systems at once in a single location and offer a more robust wireless link in challenging RF conditions, they do not support audio transmission, as well as interlaced, PsF, and 1080p 60/50 frame rates. The 40 MHz channels support audio, interlaced, PsF, and 1080p 60/50. All 3G-SDI Bolt models support metadata, timecode, and start/stop flags from many camera manufacturers, including RED, ARRI, Canon, Sony, and Panasonic. You can select either dynamic or manual frequency. The Array offers a more resilient wireless transmission, especially in challenging RF conditions, by focusing the signal and reducing interference. As a result, you may achieve a boost in the reception range, but it will not be above the maximum range.